Cromwell's golden boy will be setting records closer to home this month. Commonwealth Games gold medallist Tom Scully has confirmed he will ride with Team Cromwell to set a lap record at Highlands Motorsport Park. 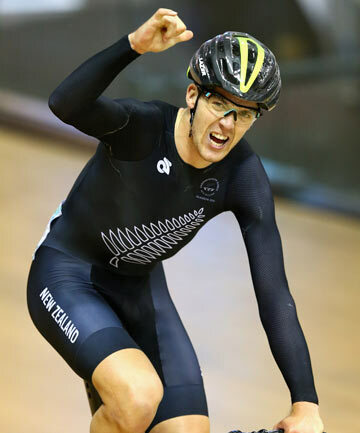 He will ride the track in his New Zealand skins and bring along the gold medal he won in the the final of the 40km points race at the Commonwealth Games in July. Anthea Tall, who manages Team Cromwell with her husband Barry Tall, said Scully had a lot to do with getting Team Cromwell off the ground, through his achievements. "Tom is a close family friend and it's through Tom we have been able to get two of our riders. It's extremely exciting and it's really good because he's come from growing up in Cromwell until he . . . went to Verdon College in Invercargill solely to pursue a career as a track rider. He still has got roots here, so whenever he's home, we try and claim him." Scully had recruited two UK-based riders, Tom Stewart, 24, and Matt Holmes, 20, for Team Cromwell - the Tour of Southland's first town team. Also in the team is Cromwell's Gavin Mason, a 2013 competitor, former Southlander Matt Marshall and Mark Spessot, 47, of Dunedin. Stewart, who came third in a stage of this year's Tour of Britain, said Scully had spoken fondly of his home in New Zealand, and the Tour of Southland. "Tom is a good friend and we regularly room together on camp or at races. He's such a class act. I have learned many things from him over the last 18 months. He's shown me photos and told me stories about the place and this has sparked my interest in wanting to visit." November was a quiet time for riders in the UK so timing of the tour worked well for him, he said. "Tom put me in touch with the organisers behind Team Cromwell and before I knew it, I had flights booked and the idea was set to turn into a reality. "I fell in love with the idea of a town promoting and sponsoring a team. The way the businesses in the area have got on board with the concept, and joined forces to make the team happen is fantastic. I think it says a lot about the community ethos and I can't wait to come and meet the people who are making it happen." Tall said 22 businesses had sponsored Team Cromwell and the wider community was showing huge support. The riders would also be treated to some adrenaline experience with rides on Goldfields Jet and a Highlands taxi ride before setting the lap record at 6pm on October 24.